The New Russian Cabinet: Which Road to Choose? We had waited for a change of government for a long time. A change of prime minister was to be expected because it was clear from the start that Mikhail Fradkov would not be one of the presidential hopefuls. As everyone remembers, Vladimir Putin was the prime minister before he became president, so the nation expected him to repeat the pattern. That was probable. So it was no less probable that the Cabinet would change shortly before one of the upcoming elections-this year's parliamentary poll or the presidential elections in March 2008. As I see it, the latter option would be in closer keeping with the Constitution because the government should report to the new parliament on its work as it resigns. What happened was quite different, and now many options lie ahead. Viktor Zubkov's prime-ministerial nomination was something of a shock. Some analysts now regard him as the next Russian president. He, too, says he may run for the presidency. If he does run, we will not learn his political priorities before next year. If he does not run, he will surely not waste time securing his present post. Then we will not have long to wait for him to pose new tasks to the new Cabinet. So we can only see what should be done, and analyze Russia's urgent problems. Many reforms have been planned but put off again and again. Since monetary grants replaced welfare privileges, only the educational reform has taken start-in some respects. 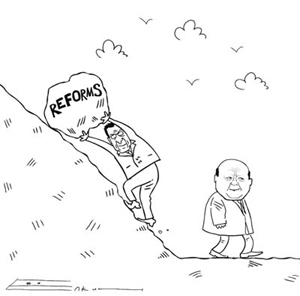 All other reforms are at a standstill. A beneficial economic situation makes us rest on our laurels. Playing into Russia's hands are high petroleum prices and considerable business dynamism, which is the principal economic vehicle and an indicator of rapid economic progress. So Russia stays complacent and optimistic. But then the business world must see what economic policy the new government will embark on. Will state interference in the economy increase with government expenditures growing and new state corporations established? Or will the state promote democracy and create a climate in which private business can thrive? We know from the Soviet experience what state interference is like. Its effect will hardly be lasting in the present conditions. Its alternative demands mechanisms of law-based management, which rests on private enterprise while the state has a regulating function. It encourages business, making it keep within legal limits at the same time. I believe that is the road a strong state should choose. To accumulate more than half of the gross domestic product and to look into everything at once is not what the state would do. Discussions on what a strong state should be have been raging in Russia for many years. This country must make the right choice in the long run. That is essential. What matters even more, the government must announce its line to the public. After that, we will be able to see what range of activities the government can have, and prognosticate further developments. To all appearances, the situation will not become clear before the presidential election.